Making wicks is an art. In olden days ladies used to make these wicks at home and use them to light lamps while performing puja. Making wicks is also a sort of good exercise to fingers and hands especially at old age. Let us learn to make these wicks at home. Raw cotton has seeds and particles which need to be cleared. Take some raw cotton and holding with both hands pull the cotton near the seed. Also separate the cotton attached to the seed and separate the seed. Also remove any particles sticking to cotton. Similarly remove seeds and particles and make the raw cotton clean. Dip forefinger of right hand in vibhuuti or vibuudi (sacred ashes). Now rub the thumb with the forefinger so that vibhuuti is smeared on both forefinger and thumb. Take some cleaned cotton and hold it in left hand lightly. Take a portion of the cotton with vibhuuti smeared fingers and pull. While pulling the cotton also twist it to form thread. Twisting the pulling cotton entangles and forms thread. To pull easily we need to hold the cotton in left hand lightly. Twisting while pulling the cotton is important to form thread or else as the cotton in other hand is loose it would break if not twisted. Like this, pull cotton and make thread to the required length. Now hold the cotton in left hand firmly and twist the thread with fingers of right hand to form a firm thread. Now hold with some tension, the thread with right hand fingers and cotton with left hand firmly so that the thread remains straight but not got wrinkled---as we have twisted the thread, it wrinkles when held loosely. Now start folding the thread around three fingers in three or five lines in total. Now remove the folds from the three fingers and hold them in a bunch. Hold the wick firmly with left hand and twist it with right hand fingers to form wick. If not twisted properly it would not form into a good wick. Now break the wick from the cotton near the left hand by pulling the wick with right hand. Depending upon the size of the lamp stand, make wicks small or bigger---for small wicks wrap around two fingers and for bigger ones wrap around three or four fingers. 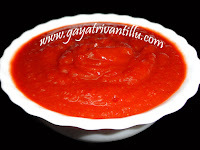 To make puvvotti (puvvu vatti) take some cotton in left hand and pull a small portion with right hand fingers. Hold the cotton in right hand fingers and twist it to form puvvotti. To make the wick bigger and to strengthen the wick wrap some more cotton around the wick portion and twist. Place the puvvotti in the centre of the lamp stand and place the longer wicks on either side of the puvvotti. Add ghee or oil and fill the lamp stand and see that the wicks are fully dipped in ghee or oil. 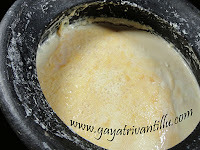 Also wet the end portions of the wick with ghee or oil so that they catch fire easily when lit. Now lit the wicks and observe---see that the long wicks are separated. I have seen my mother-in-law making these wicks daily. For her, gardening is a hobby and making wicks is a passing time. Daily she does these two jobs meticulously. She believes in performing puja to god with the flowers bloomed from the plants nurtured by her and lights the lamps near the god with the wicks made by her at home. So I had an opportunity to take photos while she was making these wicks and make a video for posterity. Now-a-days we find machine made wicks in markets in abundance. Readymade wicks are longer in size and are not twisted. When we make wicks at home we can make them to the size of the lamp stand. Handmade wicks are twisted and hence really act as wicks. On observation I have found that readymade wicks absorb oil as they are thick and also observed that there is wastage of oil ( while washing the lamp stand). As soon as oil is poured into the lamp stand all the oil is absorbed by the wick as it is not formed as a firm thread but appears as loose cotton---so we need to put add more oil in the lamp stand. As the wick is not twisted, the readymade wick absorbs oil and holds it---but at the end time observe the oil soaked wick which goes waste. But in modern days we do not have time to make wicks at home so we need to depend on readymade ones only. So before arranging the wick in the oil, rub the wick between palms to form a firm thread so that it would not absorb more oil. If time permits making wicks at home is a good exercise for fingers and hands. Honestly while young I used to feel as to why my mother-in-law is struggling to make these wicks, when they are available in the market. Today I understand that it is subtle exercise for the fingers. Similarly growing plants and performing puja with the flowers grown in your own garden is a great satisfaction. These activities keep one busy and engaged - otherwise "Idle Mind is Devil's Workshop"!! I hope the video is of some help for those who would like to make wicks at home.